↑ 2.0 2.1 "BBC – Religions – Christianity: All Hallows' Eve". British Broadcasting Corporation (BBC). 2010. Retrieved 1 November 2011. All Hallows' Eve falls on 31st October each year, and is the day before All Hallows' Day, also known as All Saints' Day in the Christian calendar. The Church traditionally held a vigil on All Hallows' Eve when worshippers would prepare themselves with prayers and fasting prior to the feast day itself. The name derives from the Old English 'hallowed' meaning holy or sanctified and is now usually contracted to the more familiar word Hallowe'en. ↑ The Book of Occasional Services 2003. Church Publishing, Inc. 2004. Retrieved 31 October 2011. Service for All Hallows' Eve: This service may be used on the evening of October 31, known as All Hallows' Eve. Suitable festivities and entertainments may take place before or after this service, and a visit may be made to a cemetery or burial place. ↑ Anne E. Kitch (2004). The Anglican Family Prayer Book. Church Publishing, Inc. Retrieved 31 October 2011. 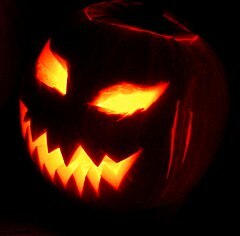 All Hallow's Eve, which later became known as Halloween, is celebrated on the night before All Saints' Day, November 1. Use this simple prayer service in conjunction with Halloween festivities to mark the Christian roots of this festival. ↑ The Paulist Liturgy Planning Guide. Paulist Press. 2006. Retrieved 31 October 2011. Rather than compete, liturgy planners would do well to consider ways of including children in the celebration of these vigil Masses. For example, children might be encouraged to wear Halloween costumes representing their patron saint or their favorite saint, clearly adding a new level of meaning to the Halloween celebrations and the celebration of All Saints' Day. ↑ Thomas Thomson, Charles Annandale (1896). A History of the Scottish People from the Earliest Times: From the Union of the kingdoms, 1706, to the present time. Blackie. Retrieved 31 October 2011. Of the stated rustic festivals peculiar to Scotland the most important was Hallowe'en, a contraction for All-hallow Evening, or the evening of All-Saints Day, the annual return of which was a season for joy and festivity. ↑ "BBC – Religions – Christianity: All Hallows' Eve". British Broadcasting Corporation (BBC). 2010. Retrieved 1 November 2011. It is widely believed that many Hallowe'en traditions have evolved from an ancient Celtic festival called Samhain which was Christianised by the early Church. ↑ "Halloween." History.com. Retrieved 24 October 2013. ↑ Nicholas Rogers (2002). Halloween: From Pagan Ritual to Party Night. Oxford University Press. Retrieved 31 October 2011. Halloween and the Day of the Dead share a common origin in the Christian commemoration of the dead on All Saints' and All Souls' Day. But both are thought to embody strong pre-Christian beliefs. In the case of Halloween, the Celtic celebration of Samhain is critical to its pagan legacy, a claim that has been foregrounded in recent years by both new-age enthusiasts and the evangelical Right. ↑ Austrian information. 1965. Retrieved 31 October 2011. The feasts of Hallowe'en, or All Hallows Eve and the devotions to the dead on All Saints' and All Souls' Day are both mixtures of old Celtic, Druid and other heathen customs intertwined with Christian practice. ↑ "BBC – Religions – Christianity: All Hallows' Eve". British Broadcasting Corporation (BBC). 2010. Retrieved 1 November 2011. The Oxford Dictionary of World Religions also claims that Hallowe'en "absorbed and adopted the Celtic new year festival, the eve and day of Samhain". However, there are supporters of the view that Hallowe'en, as the eve of All Saints' Day, originated entirely independently of Samhain and some question the existence of a specific pan-Celtic religious festival which took place on 31st October/1st November.